Boom Beach is a strategy game that combines attacks on other players with attacks against computer generated bases. 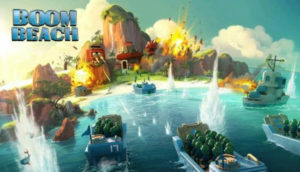 The game’s storyline is set in a tropical archipelago with the player on an island with defenses and troops (similar to Supercell’s Clash of Clans game). Storm the beach and win the day! Boom Beach is an strategic combat game where you fight a war against the evil Blackguard. Train troops and conquer both single-player and multi-player beaches in order to win trophies and resources. The battles take place in an unexplored and beautiful archipelago. Fight for every new beach, free enslaved islanders, and explore! Are you ready for the Boom? This notice is from Boom Beach official site. Players can build their base, upgrade their defenses and other buildings, and unlock troop upgrades. Boom Beach combines single player campaign play as well as the ability to attack other players in multiplayer mode on the same map. It has been a top 10 game in 22 countries at its launch. Boom Beach requires the player to collect and store resources such as gold, wood, stone, and in higher levels, iron. Gold is mainly used to train and upgrade troops while the other resources are used for constructing and upgrading these buildings. But you can buy many things from this game. The game also uses a premium purchasable currency, diamonds, which are available in small quantities from gameplay. To speed up every aspect of the game Diamonds can be used (except for submarine dives); from construction time of buildings and statues, to troop training and time of armory research. Click the below icon to download Boom Beach free online game from play store. Troops are used to conquer both single-player and multi-player beaches in order to win Trophies and the resources Gold, Wood, Stone and Iron. The Troops are deployed from Landings Crafts. All available Troops are listed and explained below. Grenadier : The Grenadier is a big and powerful long-range unit that deals area damage—rather inaccurately! Be careful about sending troops in front of him, as they might get caught in a grenade blast. Cryoneer : The Cryoneer freezes enemy buildings, slowing them down and dealing moderate damage. Be careful, as your own troops can get hit by the Freeze Beam! Heavy : The Heavy can absorb a lot of damage and still keep on moving forward. He’s happy to draw all the attention, and will take a punch to give a punch! Rifleman : Rifleman at the ready! Basic infantry units, the Riflemen are able to deal out and withstand moderate damage. In large enough numbers, they are almost unstoppable. Medic : Make love, not war! The Medic is opposed to all kinds of violence. Instead of grabbing a rifle, he heals other troops to help your cause. Tank : With its powerful gun and thick armor, the Tank is a real war machine! Due to its weight, each Tank needs extra Energy to land ashore. Scorcher : The Scorcher is a massive, armored unit with a short range and attention span. It takes a boatload of Energy to deploy and leaves with a bang, harming everything nearby. Warrior : The Tribal Warrior is an awesome sight in battle. He charges fearlessly, knowing that his Crystal Hammer will heal him with every blow. Zooka : For long-range attacks, call in the Zooka. A few Zookas can completely devastate a whole enemy base, but don’t let them come under fire from enemy turrets! There are many kinds of Buildings in Boom Beach, all with their own specific abilities. All types are listed and explained below. Headquarters : The Headquarters is the nerve centre of your base. Upgrading the HQ unlocks new base buildings and upgrades. Defensive : Defensive buildings are used to defend your base against enemy attacks. Prototype Defenses : Prototype Defenses are powerful defenses created in the Weapon Lab by using Prototype Modules. Support buildings are used to aid you with all kinds of common tasks in Boom Beach. Resource buildings are used to produce and store resources. On this page you can find some Offensive and Defensive Strategies for Boom Beach. Offensive Strategies with their own specific Troops and use of the Gunboat Abilities. Defensive Strategies with their own Base Layouts. Lt. Hammerman : Attacking strategies for all available levels of Lt. Hammerman in Boom Beach are listed and explained on this page. Defensive Strategies : Check out some Defensive Strategies for Boom Beach. Which layout should you choose? Where do you place your Defensive Buildings? Offensive Strategies : Check out some Offensive Strategies for Boom Beach. All with their own Troops and use of the Gunboat weaponry.